Kawasaki’s wide range of MULE models mean that there is a MULE for every job, no matter how big or how small. Smaller than the full-sized PRO Series models, and larger than the compact MULE SX models, the new midsize PRO-MX lineup complements the more work-focused MULE PRO Series, giving customers another capable choice for a farm, country property and or a work site. 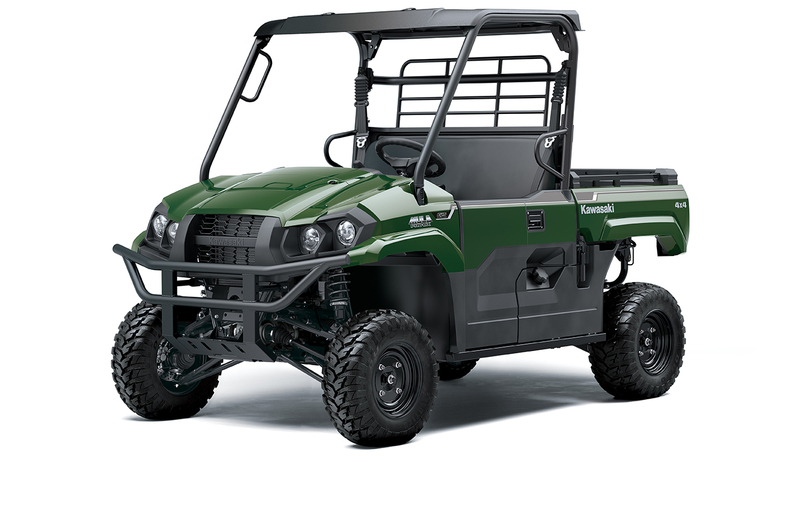 Strong engine performance from the fuel-injected 700cc Single is backed by Kawasaki’s trademark MULE performance, durability and comfort, and complemented by rugged no-nonsense styling inspired by the MULE PRO Series flagship models. Compared to the SX Series models, the PRO-MX models offer a higher top speed, and a wider tread and longer wheelbase, making them ideal midsize partners for both work and outdoor pursuits. The MULE PRO-MX is supplied with a Bonus Roof valued at RRP $445.00 fitted. Falling neatly in between the sizes of the three-seater MULE PRO-FX and compact MULE SX, the new MULE PRO-MX is ideally sized for those who feel that a full-sized UV is just too big, and that a compact does not offer sufficient room or capacity.Measuring 2,795 mm long and 1,525 mm wide, with a 2,005 mm wheelbase, the PRO-MX’s midsize package offers mobility and manoeuvrability that facilitate negotiating tight trails, while capably providing the carrying performance to make chores a breeze, or haul gear for a weekend in the Great Outdoors. MULE PRO-MX is now fitted with a plastic roof standard. Like the flagship models in the MULE PRO Series, the PRO-MX is loaded with the performance to get the job done. Its torqueful engine and rugged chassis are built tough for superb durability, making the PRO-MX a highly dependable partner for completing tasks or for a weekend adventure of fun or hunting up at the country property. In addition to offering plenty of towing and carrying capacity for hauling cargo at work or outdoor supplies for weekend fun, the highly reliable fuel-injected 700cc single-cylinder engine’s superior torque contributes to a fun-to-drive character and facilitates low-speed operation. The combination of the strong low-end torque of the single-cylinder engine with a centrifugal clutch and CVT transmission delivers very smooth response. The superb throttle control helps make the PRO-MX easy to operate. The CVT also contributes to dependable engine braking – reassuring when descending slopes. Backing up the MULE-MX’s capable performance, class-leading comfort makes doing chores a pleasure, while numerous convenience features let owners focus on the task at hand. A number of features ensure that the PRO-MX delivers class-leading comfort like its larger brethren in the MULE PRO Series. Great consideration was given to achieving a high level of ride comfort, for both driver and passenger. Thanks to its shinari-tuned frame and independent suspension, the MULE PRO-MX offers excellent bump absorption when tackling obstacles on the trail. Superb engine-braking characteristics further contribute to comfort and peace of mind. Passenger handgrip (integrated into the ROPS frame) contributes to comfort.Both seating positions are equipped with a three-point seat belt. Shoulder guards integrated into the ROPS frame provide additional passenger security. Complementing ample shoulder, knee and legroom for two adults, the bench seat features contoured seating for both driver and passenger, contributing to the PRO-MX’s superb comfort. Bright, compact outer headlamps are complemented by auxiliary LED inner headlamps. The back swept design of the panelling around the headlamps is unique to the PRO-MX, contributing to an original design. A multi-function display is built into the dash. Features include: driving mode (2WD/4WD) indicator, digital speedometer, digital fuel gauge, clock, odometer, dual trip meters, hour meter, differential indicator lamp, engine check lamp, EPS warning lamp, water temperature warning lamp, seatbelt warning lamp, parking indicator lamp, reverse indicator lamp and neutral indicator lamp. A DC socket integrated into the dashboard provides a power supply (up to 120 W) for accessory items or personal devices. Drivers can set the position of the tilt-adjustable steering wheel to suit their preference, as well as lift it out of the way to facilitate getting in and out of the vehicle. 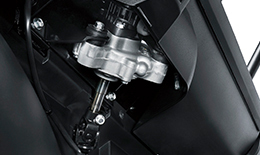 Kawasaki’s high-grade electric power steering (EPS) system is speed sensitive, offering light steering at low speed, while reducing assistance as vehicle speed increases to tighten up the steering. It also enhances ride comfort and control by acting as damping system, reducing bump steer and kickback to the steering wheel caused by shocks to the wheels. With 9.1 litres of storage space under the front hood, 5.3 litres of under-seat storage, a lockable glovebox and numerous pockets in the dashboard, the PRO-MX offers ample storage for small items. The PRO-MX offers a 317 kg cargo bed capacity, and a 680 kg towing capacity. In addition to the PRO Series-style steel bumper, a conscious choice to use steel parts for areas like the diamond-plate cargo bed and floorboards contribute to the PRO-MX’s tough image, and reflect its strong build. Shinari is a Japanese term that describes the elasticity that enables an object to bend without breaking and return to its original shape – similar to how a hunting bow or fishing pole behaves. Tuned for the ideal Shinari characteristics, the PRO-MX’s rugged frame construction benefits not only durability, but handling and ride comfort as well. The 36 litre fuel tank offers the range to enable a long day’s work or to easily allow farmers and hunters to get deep into the bush and back. Fuel tank is positioned well away from the wheels to prevent it from being hit by flying debris, and features a guard for further protection. The MULE PRO-MX is equipped with 25” tyres on 12” rims. The large 25” radial tyres provide great off-road traction, ensure ample ground clearance and complement the rugged styling. Front and rear disc brakes ensure strong, sure stopping power – especially when combined with the engine braking. The hydraulic disc system offers predictable performance, delivering brake power that matches input at the brake pedal. Additionally, the PRO MX has a 680 kg towing capacity. Standard 2” tow hitch receiver is compatible with a wide range of accessory hitches. Electrically “selectable” 2WD/4WD and dual-mode rear differential system allow easy changing between drive systems to suit changing terrain and applications. Flipping the switches causes the systems to be engaged instantly, ensuring the rider has full control of when 4WD or the rear differential lock is activated. Dual-mode rear differential provides maximum traction when in locked mode and minimises ground disturbance when unlocked. The MULE PRO-MX is supplied with a Bonus Roof valued at RRP $445.00 fitted. 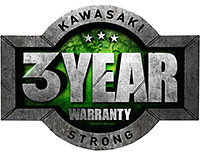 Talk to your local Kawasaki dealership about your needs.